This is a 100 year old home of the W.H. Salmon family of Harnett County. 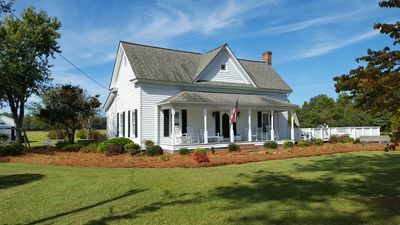 The home has been remodeled and sits on 62 acres of farmland. The acreage is currently used for farming and home to the Salmon's horses. The interior of the home is very comfortable but this is a place that you'll find peace and relaxation wondering the farm or taking in the sunset on the deck. A great alternative to a hotel or simply a wonderful place for a weekend getaway. The farm is available as a venue for special events but please call to discuss your needs as prices vary. The farm sits just Southwest of the town of Lillington and is 15 minutes from Campbell University and 20 minutes to Fort Bragg. Raven Rock State Park is within 10 minutes of the Farm. Please feel free to contact us with any questions.